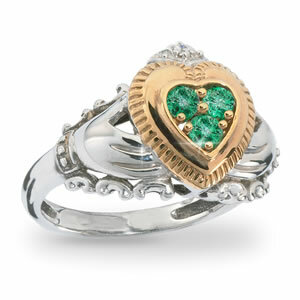 The “Claddagh Ring” has been the gift of lasting love and eternal friendship in the Emerald Isle for over 400 years. Now, award-winning designer Marjorie Andes creates an original design capturing the beauty of this time honored tradition of eternal Love. This intricately sculptured ring featuring the hands of friendship, clutching a heart of Love with 3 fully faceted emeralds (1/4 carat) and a crown of loyalty accented with a genuine diamond…destined to be a cherished heirloom.